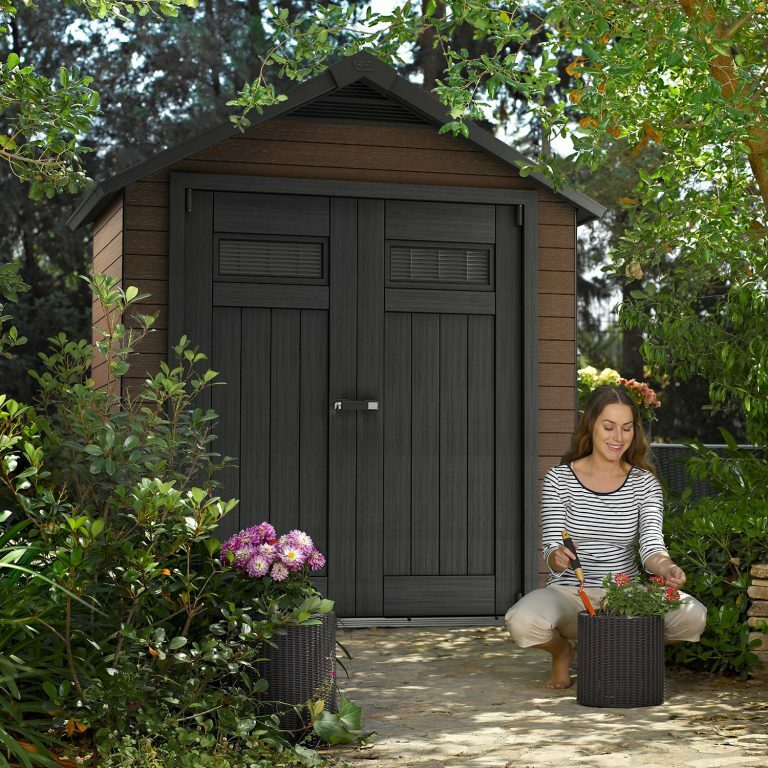 Delivering the best of both worlds relating to style and imperishability, Fusion’s composite storage sheds combine wood to appease traditional desires with the potency of resin, delivering resistance to decay and easy cleaning. Three sizes complete Fusion’s collection. They all contain identical double door access, composition, features and frontage dimensions; merely their lengths vary, leaving the smallest Fusion absent from windows in the walls due to the slimline depth. 7½ x 9 ft – Largest facility, for those wishing to organise an effortless home & garage clear-out, exploiting Fusion’s copious internal dimensions. Recently, garden sheds & decking boards have undergone revolutionary methods of manufacture, the traditional style being susceptible to weather deterioration commanding a backbreaking cleaning program along with the uphill battle of repeatable coats of wood-stain varnish, prompting many to ditch associated hassles and search for an alternative solution. Innovative composites embodying wood & resin present the conventional style meanwhile provide the backbone for weather-resistance along with ease of maintenance. In the main, a pressure hose rapidly shifts the moss & rejuvenates appearances. What started off with yesteryear’s cheesy plastic exhibit has now transpired producing some remarkably stylish compositions like Duotech’s Oakland’s Range displaying their rustic weathered appearance and the way Cascade’s picture-perfect storehouse designs are destined to complement any garden setting; Fusion’s ultra-stylish displays are of no exception. Evading metal sheds issues with dents that lead to deformity on account of their flimsy skins, Fusions are composed of dual-sided composite sheets connected together by a corrugated centre providing reinforcements & rigidity to the panels overall structure. Fusion’s manufacture comprises 70% recyclable materials. Residual wood fibres deliver the rich natural elegant tones of wood along with delivering the distinct touch of textured grain. Combining with the wood constitutes recyclable thermoplastics. The predominant ingredient polypropylene provides imperishable weather-defence – unsusceptible to rot & corrosion whilst impermeable to rainwater. Supplementary UV protection combines within the composite making Fusion’s able to withstand colour-fade issues & surface-splitting upon exposure to sunburn attack. During manufacture, the moulding procedure creates tongue & groove edges to the panel boards to attain an efficient assembly procedure. The panels simply slot together & align horizontally around the steel framework and secure with screws providing rigidity to the final construction. Fusion’s surface delivers the simplest of cleaning tasks. The undemanding role of a light spray-hose down delivers the whirlwind wash that restores their shine in minutes, however, refrain from using abrasive cleaners to prevent scratches, a power-wash or soft brush in warm water containing mellow detergent delivers efficiency in removing deep-seated dirt fast. Fusions put an end to the yearly burden associated with re-varnishing and re-painting duties, superseded by an effortless wash-down instead. Fusion roof manufacture produces twinned lined sheets of polypropylene, moulded into a stylish 3D effect resembling a slated roof. Each sheet wraps & fastens around the roof’s metal framework with screws. As the shed sizes increase throughout the range, additional steel trusses span the internal apex breadth bolstering supplementary support for heavy snow-loads. The imperishable make-up comprising polypropylene withstands structural demise when exposed to damp conditions and adverse weather. 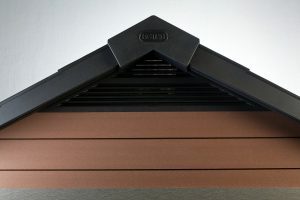 Unlike roofing felt, polypropylene’s resistance to decay averts future roof replacements, hence the huge interest in this style of capping-off structure. Fusion’s high angled apex design not only reciprocates lofty internals, it delivers an immediate first-class drainage system whilst averting puddles from establishing on top meanwhile the roof lavishly overhangs the facade creating eaves, avoiding the occurrence of internal rain seepage occurring where the walls adjoin. Fusion’s floor make-up constitutes a thickset polypropylene moulded base. Resistant to the demise of rot when sat in damp conditions escapes maintaining a disintegrating wooden floor meanwhile additional toughening strengthens the composition to subsist the endurance pressures of weighty equipment. The floor panels interlink with each other further to enclosing the shed by interlocking with the walls, maintaining a clean dry internal space by preventing rain, leaves and pests entering – great feature. Air vents positioned above the doors front and back generate a throughput of fresh air. We find this internal air current preserves storage, replaces a sweaty ambience with freshness and prevents condensation building up on the inside during the summer months. Metal sheds are renowned for producing saturated walls in humid conditions due to lacking these ventilation grids. A translucent skylight strip implants within the apex roof-ridge. Accompanied by windows in the doors and walls for the larger sheds, they illumine an abundance of daylight to the interior. Fusion sheds comprise in excess of 2 metres internal height, resulting in a comfortable atmosphere for an adult to move around at ease, eliminating the notion of feeling hemmed-in & bent-over. The fundamental drawback associated with plastic sheds relates to their inability to install shelving and hooks against the walls. 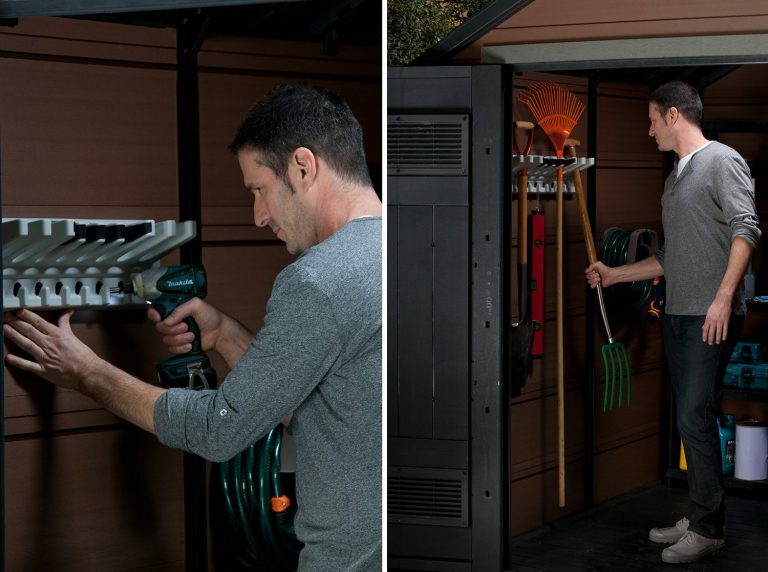 On account of the wood, Fusion’s screw-able composite provides well-favoured convenience, being able to secure hooks for wall-mounting gardening tools and the installation of shelving for storing lightweight items. There is a weight limit to what the shelves are able to accommodate, leading many to install stand-alone shelving due to their strength in supporting significant weight-loads with the added bonus of utilising Fusion’s copious ceiling height, however, they are beneficial for lightweight storage. Charcoal shaded double doors deliver extensive access into all three Fusion sheds meanwhile the floor’s sloped threshold aids wheeling-in hefty equipment. Once inside, their rectangular windows additionally emit daylight to the interior. 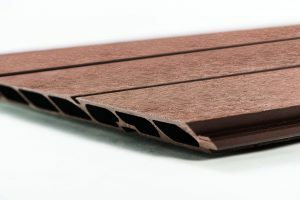 Exhibiting an attractive display resembling stylish wood panelling is created by Fusion’s innovative moulding techniques meanwhile their chunky polypropylene manufacture substantially braces the composition together, cleans easily and assures decay-resistance. A stainless-steel locking system and internal deadbolts improve security measures when comparing against Keter’s more competitive Factor Range of sheds meanwhile furnished with a stylish padlock-able handle enhance security whilst the doors function a more robust closure. Fusion’s tongue & groove formation alleviates construction headaches & streamlines assembly. Installation constitutes following & implementing the order of instruction steps, aligning the panels & securing to the metal framework. Feedback admires Fusion’s simplistic assembly procedure. Keter warns not to over-tighten the screws, just nip them up tight. A step ladder is a necessity for fitting the roof panels whilst adequate movement around all sides of the shed’s perimeter is essential to enable construction. Like any resin manufactured shed, the key principles prior to installation regard preparing a solid level base of either wood, concrete, tarmac, asphalt or paving foundations raised slightly above a floodplain for the shed to station on. This one-step process is rarely explained yet is imperative to accomplish a flawless construction that delivers robust serviceability whilst removing assembly difficulties. The vast majority of assemblers who adhere to the foundation rules provide stellar feedback, those who side-step many times struggle. A level base generates an efficient assembly, simply down to the swift process regarding the panels plumb alignment. Problems aligning the roof panels are magnified from an unlevelled base. A plumb posture derived from level footings ensures equal roof weight forces down across all sides to eliminate one-sided tensions. A perpendicular shed produces vertical door architraves, enabling easy door installation that determines precise door swings. A solid flat surface is fundamental in providing the floor with a stalwart base to operate from and endure substantial storage pressures, they are manufactured to sustain burdensome tensions if laid upon the correct substructure. Clamping the shed down onto the foundations through the anchor placements presented within the resin floor dramatically increases stability & wind resistance levels. Technical advancements have now evolved producing the desired wishes of a manufactured shed showcasing styles of tradition expressed through the natural richness of wood meanwhile blended with the durability of resin, armouring the make-up with resistance to decay. Inside, Fusions deliver a light & airy environment with generous headroom accessed by a lockable double-door entry system whilst integrating the floor and incorporating air-vents help maintain a clean, dry & fresh internal atmosphere meanwhile drill-able walls pave the way for organising gardening tools against the walls. A prompt drainage system caps Fusions off to stylish effect, tongue & groove manufactured panels significantly ease assembly whilst 10-years of Fusion warranty coupled with first-rate feedback provides reassurance however like any resin shed, foundations are pivotal to their final construction & usage. Appreciate your time inspecting Fusion’s composite range. Any related Fusion shed queries, please ask and share your thoughts below. Please share the Fusion range. Thank you. I currently have a metal one in my allotment, but after a few years is is very much dented and the doors are a struggle to close now. 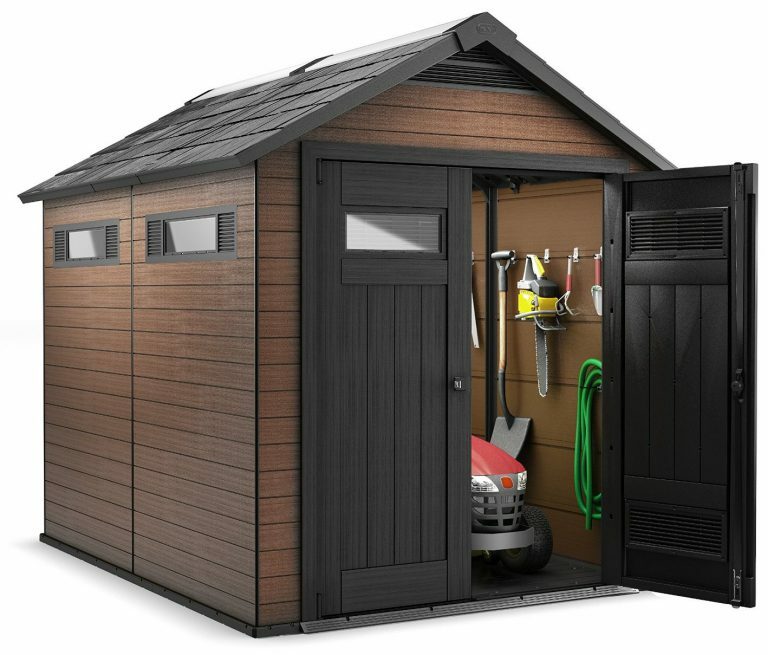 I like the look of these plastic sheds a lot, I think the medium size one would be perfect to replace the metal one I have, and there would be more than enough room to keep all my tools. I like the fact they’re so easy to clean too. 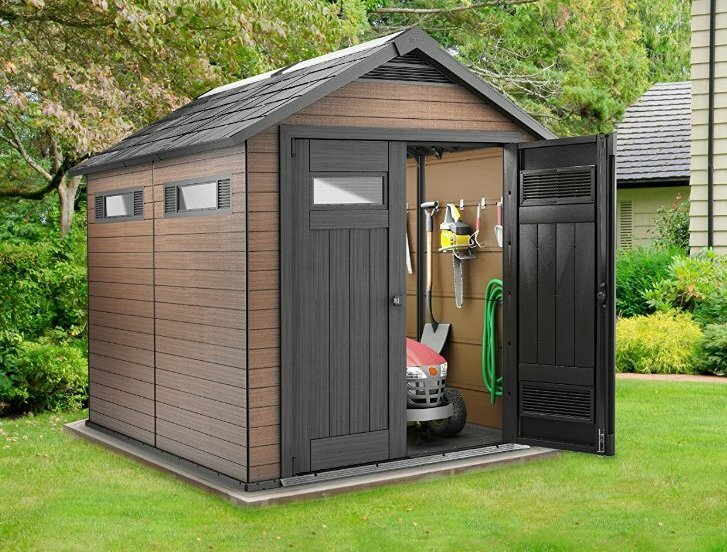 Hi Michael, thanks for calling in to explore how the make-up of Fusion’s composite storage sheds benefit garden settings. Your metal shed sounds similar to our neighbours where the door mechanism has stuck & stopped the door’s slide, leaving the door fully ajar. This occurred after gale-force winds threw the shed down the garden one night. Unfortunately, the shed was never anchored down but due to rolling down the hill it’s covered in dents. 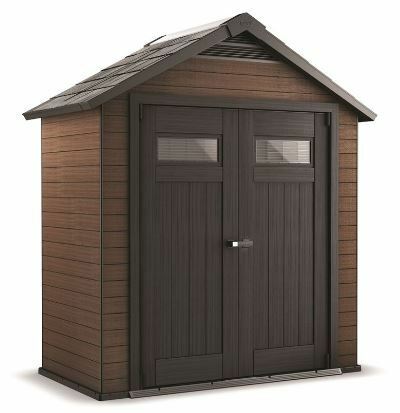 The medium sized Fusion provides a tad over 7 feet square which is ‘average size’ for a garden shed in the UK. This footprint holds a fair amount of storage including the gardening equipment, lawnmower and patio furniture. They’re quite spacious meanwhile the lofty ceiling height caters to accommodate extendable ladders and lengthy tools too. These can be hung against the walls as they are screw-able therefore allow hooks to be secured. Fusion’s are easy to clean. Nowadays we give our shed the occasional shower down with the hosepipe during watering the plants and lawn on a summer’s evening which revives the appearance in minutes meantime there’s peace of mind that their imperishability will never succumb to weather rot irrespective to whether it’s stationed in a damp location throughout its life. 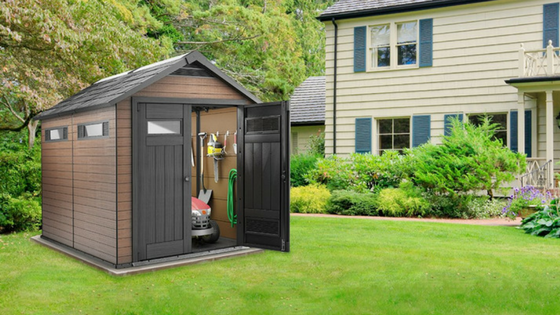 Hey Fred, thanks for calling in to read about Fusion’s groundbreaking garden shed design. Mixing wood and polypropylene together appeases those pining for the looks of traditional with the durability of rot resistant resin to ensure the composition withstands the onslaught of decomposing no matter whether the shed is stood throughout its life in a damp setting, the perfect environment for decay. Installing Fusion sheds are pretty straightforward. Their prerequisite is to station on solid level ground to ascertain the perpendicular stance functions correct door swings and prevents a skewiff lean to one side meanwhile a solid base is pivotal for the floor to contend with burdensome storage stresses further to being able to effectuate firm anchorage. Adhere to these rules and you’ll find the tongue & groove fascia panels line up at ease to achieve an efficient assembly. Great information here. It is funny, I was talking to a friend about a new garden shed for my backyard and he started talking about plastic. Of course, this wasn’t quite what I had in mind. In any event, I started looking online to see what was available. I am glad to have found your site and information. Your information is concise and very detailed. You left no stone unturned. I must say that I am impressed with the Fusion line of sheds. They look traditional and so real-looking. I almost have a hard time believing that is indeed plastic. I also liked the video. It helped me to create a better idea of what it is and how it is made. I especially love the idea that it helps to reduce mold and possible insect infiltration. Now I have another option to replace my old shed. I will surely check this out. Hi Michelle, thanks for calling in to explore Fusion’s range of composite sheds. Initially we were adamant we didn’t want another wooden storehouse on account of their continuous hassles, relating to conserving with wood-stain on an annual basis, substituting decayed panels for new which always stood out like a sore thumb until a few coats of varnish had deepened their colour and roofing felt replacements which had led to plenty of previous internal damages including storage losses once rainfall found a way in. Metal sheds were our first thoughts but we couldn’t find one which comprised an integrated floor meanwhile during our search we became rather interested in a resin manufacture simply because our thoughts turned to the way wheelie bins are comprised and how robust their make-up is to survive the ongoing tensions of the waste collection days, a shed with a similar make-up yet never abused will surely stand the test of time. So, if you’re after traditional looks for your garden setting backed with the durability of resin to counteract the forces of weather assault, Fusion’s uniquely stylish manufacture delivers resistance to rot meanwhile freshening up the fascia panels and removing mould-growth & moss becomes a cinch with a hosepipe shower. Fusion’s imperative requirement is to ensure they’re anchored down to a solid level base to ascertain their perpendicular standing functions correct door swings and prevents a skewiff stance, however, their tongue & groove formation speeds up assembly due to their quick alignment prior to securing with screws, purchasers additionally give thumbs up here. I wanted to review this web site because my son is in the market for a small storage shed. 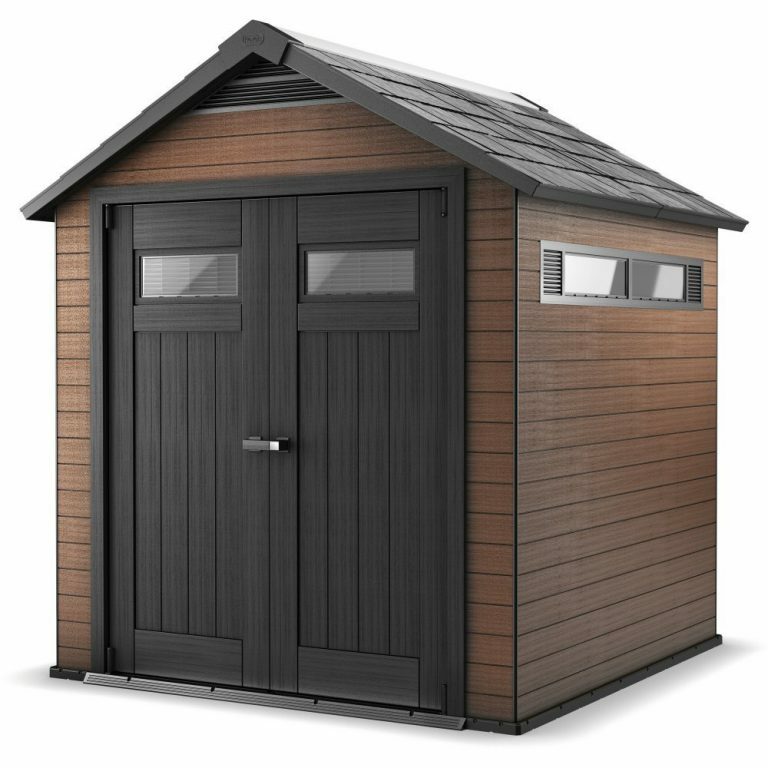 After reading the information about the quality of these particular sheds and the low maintenance I am going to recommend my son take a look at these and consider them as an option. 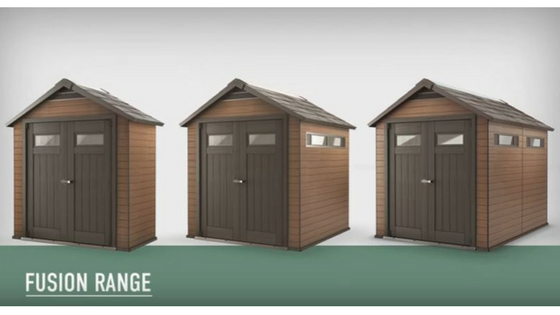 I really like the looks of all the different models of these sheds. I have a 10 X 20 size shed on my property now which is made of wood and still looks nice after several years of weather, however; it did need to be painted already to keep it looking that way. The painting is a maintenance issue that I’d rather do without so that makes these type sheds pretty appealing for me. I do have one of the large storage type boxes made of this composite material on my front porch. I keep firewood and fire starter logs in it and it is the perfect storage for that. All I have to do is wipe it down to keep the dust off of it and that’s it. Easy assembly and easy to maintain. I like the product. Thanks for visiting and reading about these new-age composite storage sheds manufactured by Keter. Low maintenance was the key issue we looked around for regarding our last shed purchase, fed up with trying to conserve the wood with yearly coats of varnish, re-felting the roof plus rotting floor problems we switched into the resin world to escape all these issues. Now it’s a case like you mention with your resin deck box, we just wipe it or lightly spray-hose it down, that’s it, no more yearly hassles. Like you mention regrading your 10 x 20 ft shed, they take some time re-coating with paint, a big job we looked to depart from. We too have a resin deck box for outdoor seating cushion storage plus table top services and extra seating stood on our patio, we find it a great addition providing convenience for storing patio accessories too. 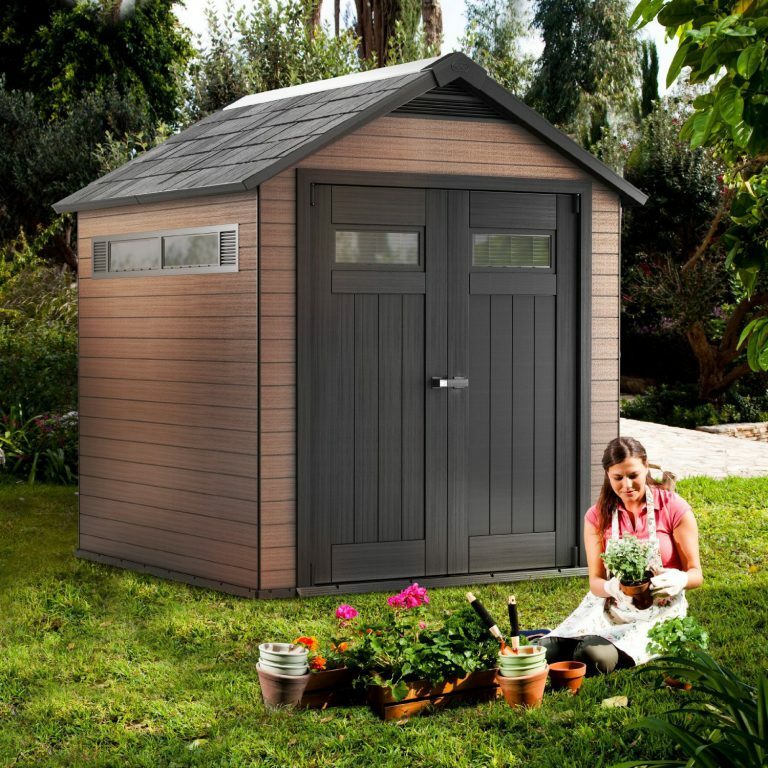 I can’t wait to replace my wooden shed with a composite garden shed. It will be so much more durable – moles dug into the floor of our wooden shed! Thanks for reading about Fusion’s composite storage sheds. Yeah, we too had constant decaying duties to deal with regarding our last wooden shed, re-roofing every once in a while due to roofing felt’s quick demise in structure once the damp sets in, yearly re-varnishing to conserve the appearance and similar to you regarding the floor, ours rotted away causing us to look around for an alternative solution. We decided on a resin Factor shed a few years back, before these composite sheds entered the market and what a difference it’s made. Our maintenance role now only requires a spray hose down once in a while. I usually do this when watering the plants on a summer’s evening. In a few minutes time the new appearance shines back through, it’s as simple as that for us. The beauty regarding a resin floor is that moles and pests won’t be able to chew through resin, so that solves that problem. Great review. I am in need of another shed and I have traditionally gone for wooden sheds. I can see the value of plastic sheds however as the have low maintenance and will last longer. After reading your review I will definitely go for a plastic shed. I really like your writing style in this post as it’s really easy to read. Thanks for dropping by and reading about Fusion’s range of composite storage sheds. Yeah, we too typically went for wood until we got fed up wasting summer days maintaining with coats of varnish to conserve the wood, trying to re-support a rotting floor and the frequent re-roofing projects they demand. We decided to look around for an alternative that didn’t require constant maintenance. The main advantages for us relate to their clean and fresh internal environment due to the integrated air vents and built in floor, the imperishable make-up that resists decay and the effortless to clean surface. I generally lightly hose ours down on a summer’s evening whilst watering the plants. Job done in minutes.